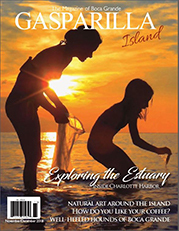 The year 2017 was relatively quiet on the island, shy of Hurricane Irma, a new look for the Range Light and new preserve land at the Causeway thanks to the Gasparilla Island Conservation and Improvement Association. We mourned the passing of several beloved island faces, including Creighton Sherman, Dee Wheeler, Doris Bishop and Wini Smart, but they will remain forever as part of our history and in our hearts. 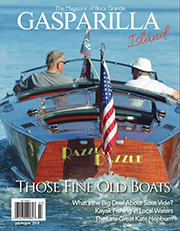 As 2017 began, islanders had the chance to witness the transformation of the long-neglected Gasparilla Island Range Light into a beautiful icon once again. The removal of the tent revealed to onlookers three months of metal restoration, sandblasting and a newly painted exterior. The Gasparilla Island Conservation and Improvement Association was pleased to report that the initial eco-restoration efforts at the GICIA Preserve at Placida were complete. Florida House Representative Ray Rodrigues spoke to Gasparilla Island Conservation and Improvement Association board members as well as a group of residents on Tuesday, January 17 in the Crowninshield Community House. 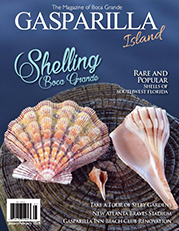 The Gasparilla Island Conservation and Improvement Association (GICIA) Board of Directors and staff were saddened by the news of the passing of Creighton Sherman. Creighton was hired as the GICIA’s first executive director and dedicated nearly 14 years of service to the Association. At approximately 5 p.m. on Tuesday, Jan. 31 the Boca Grande Fire Department and the Lee County Sheriff’s Office responded to a call at the Innlet on 12th Street, where a boat that had struck a pole in the water just south of Three Sisters Island was located. Four people were transported to Bayfront Hospital in Port Charlotte after being injured in the accident. Residents and visitors travelling on or off the island might have noticed some work crews surrounding the old railroad trestle near the mainland. Contrary to rumor they were not tearing the trestle out, but instead inspecting the trestle and, in some circumstances, replacing parts of the structure. British journalist and global affairs authority Martin Walker spoke to a crowd of 270 on Saturday, Feb. 4 at the Boca Grande Community Center. The world that our children and grandchildren will inherit was his topic this year, his third time visiting as an island speaker with the Friends of Boca Grande Community Center. The audience was spellbound. Doris Jean Zintek Bishop, 86, of Boca Grande passed away at her home on February 2, 2017. Doris had many hobbies and interests, including writing. 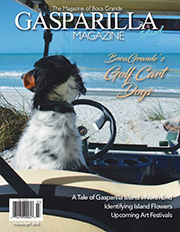 Those who have spent years in Boca Grande will not soon forget the columns written by Squeakie and Dustmop, Doris’s much-loved Lhasa apsos, that appeared in the Boca Beacon and was written about island life from a dog’s perspective. 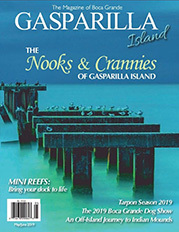 Ginger Watkins and Lee Major retained their seats as chairman and vice-chairman, respectively, of the Gasparilla Island Bridge Authority after open nominations were accepted at the organization’s quarterly meeting on Wednesday, Feb. 15.
Who will preserve the old railroad trestle guardhouse? Capt. Marian Schneider, an eco-tourism pioneer who owned Grande Tours Kayak and Paddleboard Center in Placida for more than two decades, is searching for an organization to take ownership of and preserve the old railroad trestle guardhouse. Schneider purchased the guardhouse in 1998 and housed the item on her property at Gasparilla Road and Placida Road. She would like to donate it to a historical organization that will preserve this unique historical piece. outreach efforts in Boca Grande. On March 11 at approximately 5:30 p.m. the Boca Grande Fire Department responded to a call from a vessel sinking in Boca Grande Pass. When they arrived, they found that the occupants of the boat had been pulled out of the water by nearby boaters, and their floating belongings were being retrieved. A bike path proposal that was originally created in 2014 will soon be implemented, connecting Placida road from Rotonda Boulevard West to the Boca Grande Causeway. Construction on the project started in late March. National Geographic photojournalist Ami Vitale spoke about her fascinating career covering the mayhem of combat in Kosovo at the Boca Grande Community Center auditorium on Wednesday, March 29. Jenkins, an 11-year-old Great Pyrenees owned by John Heldrich, won the highly sought “Boca Bowser” prize at the 2017 Boca Grande Woman’s Club Dog Show. Something unprecedented happened at The Island School last year that was a testament to the loyalty of the community. There were only nine openings for the kindergarten class at the end of the school year, and 14 new applications for the class. The students who weren’t chosen were placed on a waiting list. The United Methodist Women of Boca Grande announced it would be distributing $79,000 to 25 charitable organizations. The monies were raised during the 19th annual Strawberry Fest held in March at the community center. After several months of intense research, the Gasparilla Island Bridge Authority narrowed down the cause of the popping sound under the new swing bridge when it opens and closes. A little dry ice stopped the noise that occurred during the openings and closures. 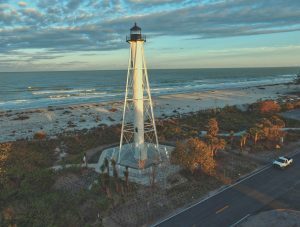 Florida Senator Lizbeth Benacquisto (R-Fort Myers) proposed an amendment (995154) to add the Port of Boca Lighthouse repairs to the historic restoration category. The amendment was adopted at a senate session on Wednesday, April 12. The budget reflected that $89,435 would be allotted for lighthouse repairs. Dee Wheeler, referred to be many as “the mom of Boca Grande,” passed away on Friday, May 12, leaving a whole bunch of us wondering what life will be like without her. Dee was the ringleader at island summer camps and later became director at the Boca Grande Community Center. She was the face behind many programs that helped shape our island’s children. Capt. 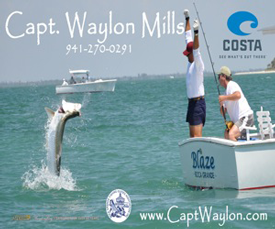 Sandy Melvin and his team aboard Boca Blue came out on top again in the 2017 Howl at the Moon Tarpon Tournament held on Friday, May 19 in Boca Grande Pass. Melvin and anglers Bob Melvin, David Kelly and Michael Foster had eight releases in the tournament. On Friday, May 26, The Island School said goodbye to seven fifth grade graduates: Charlotte Chatham, Savannah Dougherty, Israel Erausqin-Nethery, Joseph Orozimbo, Destiny Reeves, Keagan Shortuse and Julia Stewart. It was an extraordinary night of fishing for the 2017 Ladies Howl at the Moon Tournament on Saturday, June 3, with a double-header (and both brought to the boat) for one team, seven releases for the winning team and 43 whopping releases in all. The anglers aboard the Tracy Lynn knew they were on a roll when they felt their fifth release of the 2017 Gasparilla Island Kids’ Classic tug on the line at 8:08 p.m. No other team came close to that amount of fish caught and released. Summer camp isn’t always just about swimming and crafting. Kids from the Lee County Parks & Recreation summer camp program spent the morning cleaning up their community, primarily near the beach access roads. Camp counselors DJ Keisling and David Bartel, two guys who always know how to have fun, had the kids running hither and yon in a trash-finding competition. Boca Grande Sea Turtle Association volunteers had a busy season tracking predators that were harassing nesting sea turtles making their way to nesting sites on the beach. In one case, as entire nest was destroyed and up to 100 eggs were lost. The first sea turtle nest on the is- land hatched. Boca Grande Sea Turtle Association volunteers discovered the first hatch of the season on June 30 in zone 7 near at 10th street close to the range light walkway. Island residents were invited to vote for the Johann Fust Library in the American Institute for Architects and the Florida Foundation for Architecture People’s Choice Awards. The winners were announced at the AIA Convention in Naples. A 15-year-old boy visiting Boca Grande with his church youth group drowned on Saturday, July 15. According to police reports, he was swimming in the water by the rock jetty at Gasparilla Island State Park and was swept away. pleaded no contest to charges of boating under the influence, so as to avoid a homicide charge. A half-open window alerted a local restaurant owner to nefarious doings at his establishment on Friday, July 28. According to a report by Lee County deputies, the owner of South Beach Bar & Grille contacted them after observing that a back window was open. A group of history center volunteers has begun the process of cataloguing and cross referencing all materials in the history center, using a grant from the Boca Grande Woman’s Club. New computer equipment was purchased to make the archives available to all. 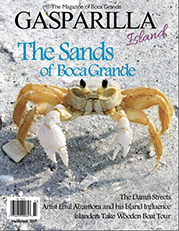 On the evening of August 11, Boca Beacon and Gasparilla Island Magazine staffers were more than happy to find out we had won a total of 12 awards from the Florida Press Association Better Weekly Newspaper Awards, and the Florida Magazine Association Awards. It had been more than 30 years since the Gasparilla Island Conservation and Improvement Association (GICIA) bike path was constructed and opened to the public. 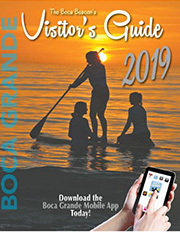 In that time, with the community’s generous support, GICIA has continued to beautify the 35 acres of property that creates the gateway to Boca Grande. A resurfacing project took place in late August giving the path a new smooth coat. 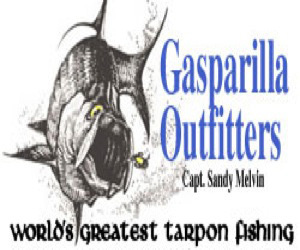 Depending on your location, Gasparilla Island received somewhere between 13 and 16 inches of rain over a five-day period in late August, with the official reading from the Gasparilla Island Water Association being 13.13 inches. Some homes along the water did have flood damage, and the Amory Chapel at the south end of the island sustained damage as well. Boca Grande Fire Chief C.W. Blosser addressed a very crowded room on Wednesday, Sept. 6. Each person in attendance was a piece in the Emergency Operations Center puzzle for our island, and Blosser briefed them regarding plans for our particular community. As of that meeting, tropical storm winds were expected to pummel the island, and rain was expected, possibly up to five inches. On Saturday, Sept. 9 we woke up to mandatory evacuations for Zone B in Charlotte County, which included almost all of the southern Cape Haze Peninsula. At 5 p.m. NOAA announced a possible landfall for Irma in Fort Myers. At 6:42 p.m. the Charlotte County Sheriff’s Office announced a curfew from 9 p.m. to 6 a.m. On Sunday, Sept. 10 NOAA announced Irma might be making her way north toward the Gulf of Mexico, which would bring her more off- shore of our coast. By 8:51 p.m. everyone in this area realized the worst was over. Our island was spared by Hurricane Irma on the anniversary of the day her big sister, Donna, slammed us in 1960. Winifred “Wini” Smart Quackenbush passed peacefully at the age of 85 in Ellsworth, Maine after a long illness, surrounded by her loving family. The Boca Grande Historical Society announced one item on the next meeting agenda was a proposal to modify the property at 1050 E. Railroad Ave. to accommodate a four-bed assisted living facility. 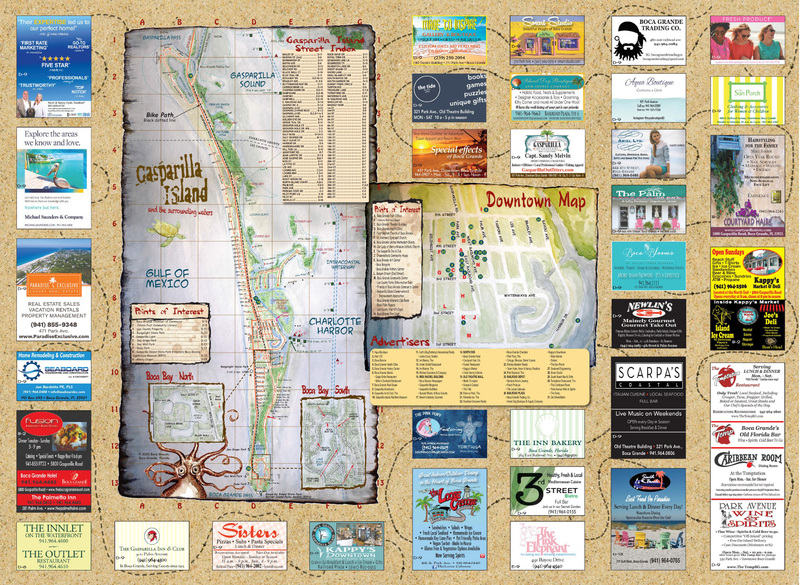 The proposal was submitted by Phanta Sea Assisted Living. The 2,600 sq. ft. property was recently used as a $20,000-a-month rental home provided by Gulf to Bay Sotheby’s. The proposal was voted down by the board in an October meeting. It was good news to hear that after renting property for more than 13 years, The Venice Wildlife Center finally had the opportunity to own its own land. 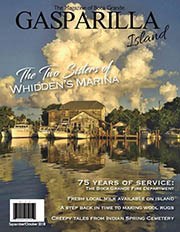 It was the opening of another beautiful season at The Gasparilla Inn & Club on Wednesday, Oct. 4. Tours of the historic inn were taken, Vinny (with a “y”) and Tina were on hand to greet the guests, large shrimp and other delicious hors d’ oeuvres were consumed. Florence T. Jelks Robinson passed away on September 23, 2017. She was born and raised in Boca Grande and was very well known as one of the kindest, smartest women to walk the island. She was a true disciple of Christ in the truest form, and everyone who knew her could see the light shining from her soul. The fate of an old Florida fishing property just off island was discussed at a public meeting held by the developer on October 18, with hundreds in attendance holding varying opinions. The Royal Palm Players started their 2017-18 season in November with a new president named Hal McCombs, who was hoping to get some new faces on the stage to join in the fun. As of October 31, all Boca Grande streets had been cleared of lawn debris that was put out to the curb. This was the last pickup for Hurricane Irma landscaping waste. The Boca Grande Historic Preservation Board on Wednesday morning unanimously approved a request to add a freestanding, covered pavilion over the outdoor concrete stage at the Boca Grande Community Center. The addition would be constructed in the north-side courtyard with the intention to provide shade, rain cover and acoustic enhancement. When Boca Grande residents Peter and Elsa Soderberg learned that Suncoast Humane Society needed a catalyst to help kick-start the campaign for a new campus, they took action. The Soderbergs scheduled a meeting with Executive Director Phil Snyder and offered a $1 million gift to get the project going. The organization needs $9 million to build the new facility. 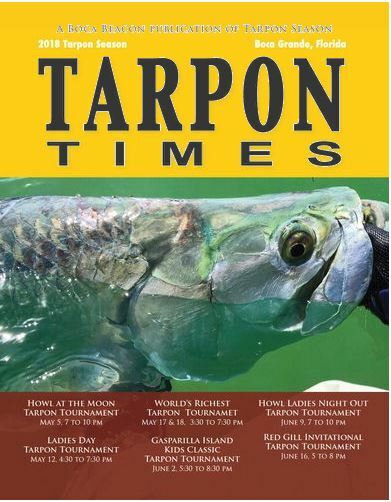 The event is scheduled for Monday, Feb. 6 at the Boca Bay Pass Club. Tickets are $125. The Brett Foreman Band were announced as the featured musicians. Residents and guests of Boca Grande were able to enjoy browsing through local produce, seafood, flowers and a variety of other items a bit earlier this season when the Boca Grande Farm and Fish Market returned on Friday, Dec. 22. Big news from the frontlines of the Pink Pony: They have a new penny press with four different Boca Grande designs to choose from, including the Pink Pony’s legendary horse, World’s Best Tarpon fishing featuring a tarpon, the silhouette of the Port Boca Grande Lighthouse and an outline of the island itself. The Boca Grande Health Clinic announced that Dr. Raymond James would be joining its medical staff in March of 2018 as a full-time physician. physician on staff. Dr. James comes to the island from Englewood Community Hospital where he has served as the Director of Emergency Medicine for 10 years. He is also the founder and president of the Englewood Community Care Clinic, a provider of free medical care to people who can’t afford health insurance. Boca Grande resident Libby Frazier announced a campaign to “Build an Ark,” to help a community of people who are lacking the basic necessities to sustain healthy lives. Heifer International is an organization that brings help and hope to millions of impoverished families worldwide. The ark packages includes pairs of livestock that are send to communities in need to provide sustainable food as well as the opportunity to share the offspring with neighboring communities.